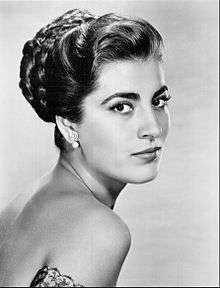 Irene Papas (Greek Ειρήνη Παππά; born 3 September 1926) is a retired Greek actress and occasional singer, who has starred in over 70 films in a career spanning more than 50 years. Papas was born as Irini Lelekou (Ειρήνη Λελέκου) in Chiliomodi, outside Corinth, Greece. Her mother was a schoolteacher, and her father taught classical drama. She serves on the board of directors of the Anna-Marie Foundation. Papas began her early career in Greece (she was discovered by Elia Kazan), achieving widespread fame there, before starring in internationally renowned films such as The Guns of Navarone (1961) and Zorba the Greek (1964), and critically acclaimed films such as Z (1969). She is a leading figure in cinematic transcriptions of ancient tragedy since she has portrayed Helen in The Trojan Women (1971) opposite Katharine Hepburn, Clytemnestra in Iphigenia (1977), and the eponymous parts in Antigone (1961) and Electra (1962). She also appeared as Catherine of Aragon in the film Anne of the Thousand Days, opposite Richard Burton and Geneviève Bujold in 1969. In 1976, she starred in the film Mohammad, Messenger of God (also known as The Message) about the origin of Islam, and the message of Mohammad. One of her last film appearances was in Captain Corelli's Mandolin. She is currently working in theatre in Portugal. In 1978, Papas collaborated with composer Vangelis in an electronic rendition of eight Greek folk songs, issued as a record called "Odes". They collaborated again in 1986 for "Rapsodies", an electronic rendition of seven Byzantine liturgical hymns. In 1982, she appeared in the film Lion of the Desert, together with Anthony Quinn, Oliver Reed, Rod Steiger, and John Gielgud. Papas was a member of the Communist Party of Greece (KKE), but was also a close personal friend of former Prime Minister Andreas Papandreou and his third and final wife Dimitra Liani. When Liani was attacked by the Greek media, for her alleged influence on her sick husband during Papandreou's final premiership (1993-96), Papas spoke out in favor of her. In 1969, the RCA label released Papas' vinyl LP, Songs of Theodorakis (INTS 1033). This has 11 songs all sung in Greek but with sleeve notes written in English by Michael Cacoyannis. One of the more unusual moments in Papas' career came in 1970, when she guested on the album 666 by Greek rock group Aphrodite's Child on the track "∞" (infinity). She chants "I was, I am, I am to come" repeatedly and wildly over a percussive backing. The track was considered lewd by record company executives, and resulted in the album being withheld from release for two years by Polydor Records. Upon its release in 1972, the song caused some furor in Greece and was again accused of lewdness and indecency by Greek religious figures and government authorities. In 1979, Polydor released her solo album entitled Odes, with music performed (and partly composed) by Vangelis Papathanassiou (also previously a member of Aphrodite's Child). The words for the album were co-written by Arianna Stassinopoulos (Arianna Huffington). In 1986 Papas released a further album in collaboration with Vangelis, entitled Rapsodies (Polydor CD 829 413-2). 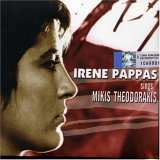 A later CD, Irene Pappas Sings Mikis Theodorakis, was officially released in 2006 on the FM label (FM B0002GSA8G), but a wider selection of the songs, all sung in Greek, had been circulating as bootleg tapes for many years. Papas was known to Mikis Theodorakis as early as 1964 from working with him on Zorba the Greek. Some of the songs, performed with passion and skill by Papas, have a Zorba-like quality, e.g. Αρνηση (Denial, on the CD) and Πεντε Πεντε Δεκα (Five Five Ten, not on the CD), so it seems likely they date from soon after 1964. The Theodorakis songs sound more like traditional Greek Bouzouki music than the Vangelis works. ↑ Profile, filmreference.com; accessed 30 April 2015. ↑ "Press Conference on the developments regarding the 'Anna-Maria' Foundation", greekroyalfamily.org, 28 August 2003. 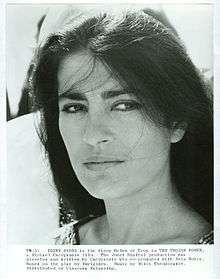 ↑ "Irene Papas - Rapsodies". Vangelismovements.com. Retrieved 2016-11-13.